Players can build their characters with the active skills they want. Players are not given skills as they level up, they must choose what skills they take. 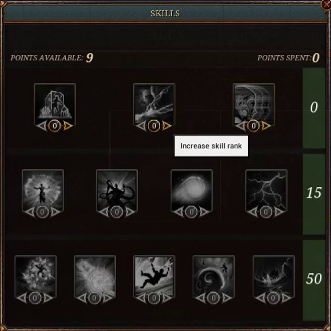 The number of skills on the action bar will be contained (fewer than 30). For example: One Fighter will be different from another based on what active skills they have chosen. Through skill choice, players can customize their combat experience to focus on tab targeted skills, action targeted skills, or a mix of both. There is no spellbook requiring memorization. Crafters will be able to assign different skills/abilities and stats on armor. Example of keystroke time-frame, activated by using a weapon within the red area. A weapon's most important feature is its weapon use ability (also referred to as quicktime bar, combo system or keystroke timeframe). Each weapon use ability has a unique keystroke time-frame that initiates upon weapon use. The precision system (hitting within the red area) activates the skill. The skill can then combo into other weapon use abilities. Hitting within the red area focuses energy into a player's ultimate skill. The weapon held in the main hand slot determines the active weapon ability. 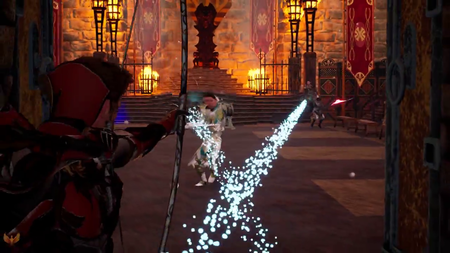 Bow's combo Target an enemy and use your bow to strike with two arrows. Dealing damage and powering up your focus with this weapon attack. Prepares four arrows. Prepared shot works on all arrow attacks. The aspiration for combat is for abilities to have corresponding counter-play abilities. Crowd control (CC/mezzing) abilities include root, snare, stun, sleep and slow. There will be diminishing returns on stuns, sleep and slows so as to avoid stun locking. Crowd control won't likely be tab-targeted skills. This is to avoid imbalanced combos with skill shot (action targeted) abilities. Ice prison Target an enemy and summon a prison of ice around them, paralyzing them. Adds damage over time. Snares after root breaks. Impale Target an enemy and lauch a spear to damage and pull the enemy into melee range. Lasso effect pulls the target to the tank and does damage. Adds a stun. Adds damage over time. Jump Dash with cooldown. Cooldown is replaced by charges with individual cooldown. Drops a bear trap at the location the ranger dashed from. Proximity chain stun Chains enemies to a center point. If enemies leave proximity of the point the chain breaks and they are stunned. Chain is only applied when the ability is cast. Enemies that are chained take extra damage from all incoming sources. Allies in range when chain is cast gain extra health from heals. Shield might Single target knock down or stun (bash). Changes to a frontal cone attack. Increases the block chance for a duration after success. Duration of block chance increases based on the number of targets hit. Shield throw Throws shield and adds hate. Changes to cone attack. Add stun to the first target hit. Snare Foot pin roots target in place. Adds a bleed. Snares after root expires. Soul paralysis Channel a lock down of a single target. Both you and the enemy are held in place. Increased resistances to being disabled. Caster takes reduced damage while channeling. Tentacles Creates an area of effect around the caster that roots targets. Adds damage over time to targets and increases range. Increases duration. Trap Place a bear trap under the caster that holds them in place and does damage. Also holds targets in place and does damage. Traps stun instead of root. Place up to two traps. Very few abilities will require a player to remain stationary during combat. Prone and crouch will likely not be in the game. Mage's escape Step into another dimension momentarily and emerge far ahead of your original position. Blink teleport out of danger. Clears targets and aggro reduction. Clears crowd control. Sprint Increases movement speed. Using an ability ends sprint. Increased resistance to disable abilities. Clears crowd control when sprint starts and removes silence. Abilities with a cast bar can be interrupted during the cast. There are abilities to counter interrupts. Some interrupts are better than others. Bulwark (Tank ability) Summon a wall in front or behind the tank. Enemies are knocked down if they contact the wall. Adds damage to the knockdown. Tank is able to place the wall anywhere on the battlefield within a certain distance. Charge Charge to a single target on the battlefield (friend or enemy) and do damage to enemy targets upon reaching them. Additional physical and magical mitigation upon reaching the target for a short duration. Does damage and knocks down enemies between caster and target. Ice sheet Creates an area where enemies are knocked down. Snares two targets in area. Increases size and duration. Quake If your focus is at 80%, cast this spell to split the earth itself before you, launching a line of AoE damage. Knock down those hit by your arcane might. Reduces focus cost and cooldown for the skill. 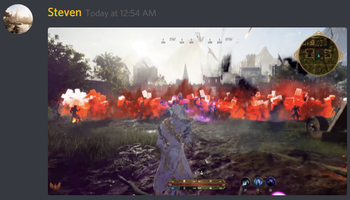 Ashes of Creation Apocalypse action combat. It may not be possible to be able to fully spec into just action or tab targeted skills. 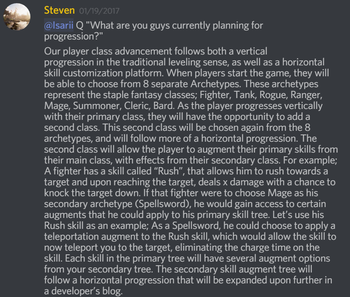 There might be a 75% cap on choosing skills from any one type. Action oriented and tab oriented versions of skills will have different characteristics. Variables will change based on which version is chosen. Hard Crowd control (CC)s may be housed in action oriented skills because they are skill shots that are more difficult to land. Softer CC's would be housed in tab-targeted abilities. Arch lightning Launch a bolt of lightning in a forward line, damaging all within its path. Adds damage over time to targets hit. Chains to nearby enemies that are not hit. Anyone who is outside the line has a chance to get a bolt jump to them. Flame line Shoot an arrow that leaves behind a trail of flames. Arrow explodes upon reaching the end of its distance. 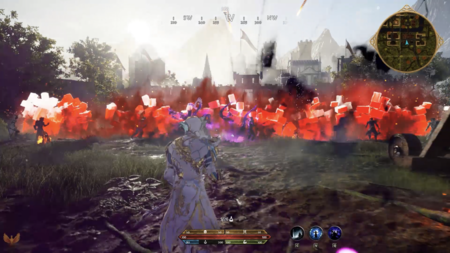 Enemies take burning damage for entering the flames. Melee strike Does damage and adds hate. Damage over time hate over time. Changes to cone effect. Power shot Use this skill to charge up a shot that fires forward in a line, damaging all enemies it touches. Chance to cause bleed damage over time. Splits into a fan of arrows in a cone. Radius increases based on hold duration. Righteous fury Use your ultimate when your focus has reached 80%, to launch spears at all targets within your forward arc. Dealing damage and pulling them to you. Pulls targets in a cone to the caster and does damage. Adds target lock and hate. All targets pulled now target lock the Tank and their hate is increased. Increases the arc radius to 360°. Slice Cone melee attack. Becomes a 360° melee attack. Adds hemorrhage (bleed) damage. Charged beam Channels a beam attack to a single target. Damages over time after channel. Damages enemies between caster and target. Cover Target a friendly player, to absorb 50% of their incoming damage for 6 seconds. Increases damage that's redirected. Gives the target damage reduction buff for the duration. The damage reduction applies to both the tank and the ally. Endow life Resurrect target if they are dead. Prevents death if they are alive. Resurrected players don't return to life at 100% health and mana values. Increases duration of death prevention buff. Resurrects target to 100% hit points and mana points. Hatred Single target that adds hate. Add a forced target lock. Add hate over time per tick. Implosion Launch a powerful burst of fire (fireball) against a single target. Becomes a burn (damage over time). Area of effect around the target. Knockback shot Knocks a target back X distance. Adds damage. Add knockdown. Life bolt Deal damage to enemy based on the casters missing health. Adds an area of effect. Slows enemies hit by the blast. Marked arrow Target an enemy to use this skill, causing that enemy to take additional physical damage. Enemy takes additional magical damage. Increases the duration of this debuff. Righteous blessing Deliver a spot heal. Adds heal over time. Adds damage over time to adjacent enemies. Safe space Targeted party member (can be self) is removed from combat for duration. They are sent to some extra dimensional location. Banished target gets extra mana while banished. Reduced cooldown. The ultimate skill is a very powerful skill. Can be used when enough focus has been accumulated from using the Weapon use ability. Divine form If your focus is at 80%, use this skill to increase heals and damage of your skills by 25% for 8 seconds. Applies an AoE heal over time to friends and damage over time to enemies. Pulse AoE heal and damage around the caster. Reduces hate for the caster on enemies hit by the pulse. 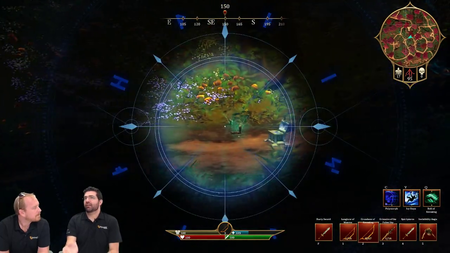 Enemies targeting the caster lose target. Increases effectiveness of all heals while cast in this form. Hail of arrows If your focus is at 80%, use this skill to summon a template and launch multiple arrows within the template. Adds movement slow. Adds damage over time to targets in the area. Ultimate defense skill Ultimate ability: Uses focus to increase your physical and magical defenses as well as immobilizing you. Receive increased healing from outside sources while active. Breaks crowd control on cast and grants invulnerability to crowd control. Bards have engaging combat abilities, not just buffs. Bards will not be the "downtime" class. This is the role of social spaces within nodes. Bards will have utility outside of combat, like all other classes. Restoring rested XP will not be a Bard utility. Bard buffs are related to how they perform in combat. If a bard lands a skill shot against a target, allies within a certain range will be granted a temporary buff that relates to the skill that the bard used. Clerics have control over life and this may relate to utility abilities that relate to corruption. Banish Teleport target a distance away from the caster. Decrease hate threat from those enemies and increase the distance. If the target is currently targeting the caster the target will clear. Snare two enemies that are banished. Port them away and then they're slowed. Life's balance Balance the life percentages of all party members to the average percentage of health. Reduced cooldown. Adds a heal over time on everyone. Lifeline Chain heal to friendly targets. Add damage to enemy in range of final group member healed. Heal and damage increases based on the number of allies that will be hit by the ability. Stacks up to four of five times. 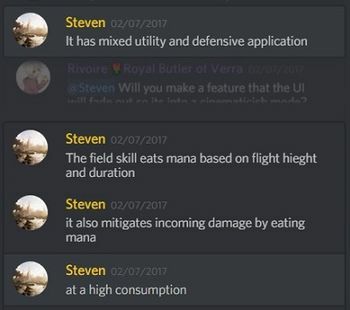 Mana pool (passive) Increased mana pool. Further increased to mana pool. Every Nth cast is free. Mana well Gain X mana per pulse. X must be either percentage based or based on weapon damage. Bonus health per pulse. Allies in the well get a physical and magical defensive buff. Medium armor (passive) Increases armor given by medium armor. Further increases armor given by medium armor. If medium armor worn in all slots gives a balance of health and mana less than the health given. Stolen blessing Drop a totem to damage enemies within range. Ticks damage on targets in range of the AoE. Provides that damage done as heals to allies in range of the totem. Slow movement of enemies in AoE range of totem. Always on for enemies in range. The Fighter archetype will include maneuverability and "closing the gap" mechanics to enable the fighter to quickly traverse distances on the battlefield. After image Summon shadows of yourself to confuse your enemies, granting you momentary invulnerability. Lasts 4 seconds. Mirror image evasion buff. Increased evasion. Bonus damage while buff is active. Black hole Pulls all enemies to a point picked by the caster after a short delay. Snares targets after pull. Black hole explodes at the end of the pull duration dealing damage. Cloth armor (passive) Increases armor given by cloth armor. Further increases armor given by cloth armor. Bonus mana for each piece of cloth armor. Portal Create a portal under the caster and place a second portal in a location picked by the caster. Portal will only work for a certain number of players. May be able to be used offensively. Increases range. Using portal reduces threat and clears targets. Fleeting shot Retreating shot rolls backward and does damage. Increases max range. Breaks crowd control. Light armor (passive) Increases armor given by light armor. Further increases armor given by light armor. Each piece of light armor increases damage. Ranged passive Reduces minimum range of all abilities. Increases max range of all abilities. Increases crit chance. This effect has a cooldown. All classes are capable adventurers, but rogues excel at delving the deepest dungeons and finding the most hidden of treasures. The summoner uses many abilities that channel through their summon. The summoner is essentially playing through their summon. Abilities from the summon appear on the summoner's hotbar. Summoner has control over their summon. Summoners will likely not be able to fuse with their summons (eidolons). Summons can be leveled through the application of skill points to their active skill. Summoners summon different summons, depending on the class they choose. Zombies, skeletons and other undead creatures. Some summoners may summon multiple things. Other summoners may only summon one powerful thing. Certain summoners may only be able to summon effects and/or temporary energies. Augments from a secondary archetype can be applied to a summons. Absorb bubble Absorbs a fixed amount of damage then does that damage to nearby targets upon expiration. Increases the duration of the buff. Adds thorn damage while absorb is active. Block (passive) Increases your block percentage by X. Further increases block. Chance to deal weapon damage on a successful block. Crowd control break Breaks non-animated knockdown crowd control effects (such as root, snare and stun). Increases resistances to crowd control effects. Gain focus for each CC effect that is cleared through this use. Heavy armor (passive) Increases armor given by heavy armor. Further increases armor given. Each piece of armor added gives health percentage bonus to the tank. Summoners can collaborate to summon larger summons, such as Golems. A siege summon will have an incremental size based on the number of summoners participating in that summon activity, with a maximum of eight. The number of summoners participating in the summon will determine its overall size. All summoners must be in the same party and the party leader must be a summoner. The party leader initiates the summon and then takes control of it. Once summoned, the party leader cannot be changed. If the party disbands, the summon ends. There will be a grace period to handle disconnects. The party may also contain non-Summoners. Alpha-1 castle siege combat featuring a Tank siege ability. Pre-alpha rogue climbing a Metropolis wall. A utility skill is a non-combat skill that interacts with the environment. Utility skills lend themselves toward how classes navigate and deal with hazards in the world. Different classes excel at different skills. All classes will have maneuverability/traversal utility abilities. There will be a grappling hook utility skill or item. Classes will have utility abilities, such as detecting traps and other hazards. For example: The Mage's detection spell casts light and reveals magical explosive hazards. 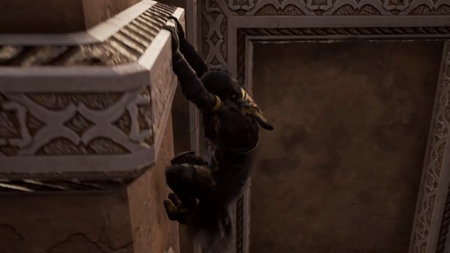 Certain classes are able to climb/parkour in certain areas. Climbing ability is not free-form. Certain classes (such as Rogues) will have stealth abilities. Rogues may also have a spyglass utility skill. Players will not be able to transfer their skills to other players. All Kickstarter backers will receive a skill effects (FX) set. Includes unique colors and additional effects for certain skills. For example: A mage with her fireball skill may fire off a ball of searing white flames as opposed to the traditional colors of that skill. ↑ Livestream, 15 December 2017 (24:25). ↑ 8.0 8.1 Livestream, 28 July 2017 (19:05). ↑ 9.0 9.1 Livestream, 16 November 2017 (30:02). ↑ 11.0 11.1 Interview, 11 May 2018 (53:15). ↑ 13.0 13.1 13.2 Interview, 8 August 2018 (22:27). ↑ Livestream, 3 May 2017 (15:15). ↑ 15.0 15.1 Livestream, 3 May 2017 (17:59). ↑ 16.0 16.1 Livestream, 16 November 2017 (30:45). ↑ Livestream, 19 May 2017 (43:09). ↑ 18.0 18.1 Podcast, 4 August 2018 (59:58). ↑ 22.0 22.1 Livestream, 17 August 2018 (18:19). ↑ 23.0 23.1 23.2 23.3 Interview, 17 August 2018 (6:03). ↑ 29.0 29.1 29.2 Livestream, 17 August 2018 (7:49). ↑ 46.0 46.1 46.2 46.3 46.4 Livestream, 30 June 2017 (26:47). ↑ Interview, 11 May 2018 (16:32). ↑ Podcast, 11 May 2018 (54:40). ↑ 49.00 49.01 49.02 49.03 49.04 49.05 49.06 49.07 49.08 49.09 49.10 49.11 49.12 49.13 49.14 49.15 PAX West 2017 Ranger poster. ↑ 50.0 50.1 50.2 50.3 50.4 50.5 Livestream, 16 October 2017 (45:21). ↑ 51.00 51.01 51.02 51.03 51.04 51.05 51.06 51.07 51.08 51.09 51.10 51.11 51.12 51.13 51.14 PAX West 2017 Tank poster. ↑ 52.00 52.01 52.02 52.03 52.04 52.05 52.06 52.07 52.08 52.09 52.10 52.11 52.12 52.13 52.14 52.15 52.16 52.17 52.18 52.19 52.20 52.21 52.22 52.23 52.24 52.25 52.26 52.27 52.28 52.29 52.30 PAX West 2017 Mage poster. ↑ 53.00 53.01 53.02 53.03 53.04 53.05 53.06 53.07 53.08 53.09 53.10 53.11 PAX West 2017 Cleric poster. ↑ 55.0 55.1 Livestream, 18 January 2018 (22:46). ↑ 56.0 56.1 56.2 56.3 56.4 Livestream, 24 May 2017 (45:12). ↑ 57.0 57.1 57.2 57.3 Livestream, 16 October 2017 (25:56). ↑ Livestream, 9 February 2018 (28:17). ↑ 59.0 59.1 59.2 59.3 Livestream, 8 April 2018 (PM) (37:57). ↑ 60.00 60.01 60.02 60.03 60.04 60.05 60.06 60.07 60.08 60.09 60.10 60.11 Livestream, 16 October 2017 (39:02). ↑ 61.00 61.01 61.02 61.03 61.04 61.05 61.06 61.07 61.08 61.09 61.10 61.11 61.12 61.13 61.14 61.15 61.16 61.17 61.18 61.19 61.20 61.21 61.22 61.23 Livestream, 16 October 2017 (23:02). ↑ 62.0 62.1 62.2 62.3 62.4 62.5 62.6 62.7 62.8 Livestream, 16 October 2017 (45:52). ↑ 63.0 63.1 63.2 63.3 63.4 63.5 Livestream, 16 October 2017 (34:52). ↑ 64.00 64.01 64.02 64.03 64.04 64.05 64.06 64.07 64.08 64.09 64.10 64.11 Livestream, 16 October 2017 (28:36). ↑ 65.00 65.01 65.02 65.03 65.04 65.05 65.06 65.07 65.08 65.09 65.10 65.11 65.12 65.13 65.14 Livestream, 16 October 2017 (44:49). ↑ 66.0 66.1 66.2 66.3 66.4 66.5 66.6 66.7 66.8 Livestream, 16 October 2017 (36:15). ↑ 67.0 67.1 67.2 67.3 67.4 67.5 Livestream, 16 October 2017 (43:14). ↑ 68.0 68.1 68.2 68.3 68.4 68.5 68.6 68.7 68.8 Livestream, 16 October 2017 (47:29). ↑ 69.0 69.1 Livestream, 8 May 2017 (43:30). ↑ Livestream, 4 June 2018 (25:50). ↑ 72.0 72.1 72.2 72.3 72.4 72.5 Livestream, 16 October 2017 (39:42). ↑ 73.0 73.1 73.2 73.3 73.4 73.5 Livestream, 16 October 2017 (46:22). ↑ 74.0 74.1 74.2 74.3 74.4 74.5 Livestream, 16 October 2017 (22:37). ↑ 75.0 75.1 75.2 75.3 75.4 75.5 75.6 75.7 75.8 Livestream, 16 October 2017 (26:54). ↑ 76.0 76.1 76.2 76.3 76.4 76.5 76.6 76.7 76.8 Livestream, 16 October 2017 (42:08). ↑ 77.00 77.01 77.02 77.03 77.04 77.05 77.06 77.07 77.08 77.09 77.10 77.11 77.12 77.13 77.14 Livestream, 16 October 2017 (40:14). ↑ 79.0 79.1 79.2 79.3 79.4 Podcast, 4 August 2018 (1:07:59). ↑ 80.0 80.1 80.2 80.3 80.4 80.5 Podcast, 4 August 2018 (1:11:05). ↑ 81.0 81.1 81.2 81.3 81.4 81.5 81.6 81.7 81.8 Livestream, 16 October 2017 (39:15). ↑ 82.0 82.1 82.2 82.3 82.4 82.5 82.6 82.7 82.8 Livestream, 16 October 2017 (46:52). ↑ 83.0 83.1 83.2 83.3 83.4 83.5 Livestream, 16 October 2017 (29:08). ↑ 84.0 84.1 84.2 84.3 84.4 84.5 Livestream, 16 October 2017 (44:06). ↑ 85.0 85.1 85.2 85.3 85.4 85.5 85.6 85.7 85.8 Livestream, 16 October 2017 (24:37). ↑ 86.0 86.1 86.2 86.3 86.4 86.5 Livestream, 16 October 2017 (47:14). ↑ 87.0 87.1 87.2 87.3 87.4 87.5 Livestream, 16 October 2017 (42:42). ↑ 88.0 88.1 88.2 88.3 88.4 88.5 Livestream, 16 October 2017 (23:30). ↑ 89.00 89.01 89.02 89.03 89.04 89.05 89.06 89.07 89.08 89.09 89.10 89.11 Livestream, 16 October 2017 (33:48). ↑ 90.0 90.1 90.2 90.3 90.4 90.5 Livestream, 16 October 2017 (21:48). ↑ 91.0 91.1 91.2 91.3 91.4 91.5 91.6 91.7 91.8 Livestream, 16 October 2017 (38:35). ↑ 92.0 92.1 92.2 92.3 92.4 92.5 Livestream, 16 October 2017 (46:43). ↑ 93.0 93.1 93.2 93.3 93.4 93.5 Livestream, 16 October 2017 (36:57). ↑ 94.0 94.1 94.2 94.3 94.4 94.5 94.6 94.7 94.8 Livestream, 16 October 2017 (31:58). ↑ 95.0 95.1 95.2 95.3 95.4 95.5 Livestream, 16 October 2017 (40:23). ↑ 97.0 97.1 Livestream, 9 July 2018 (58:26). ↑ 98.0 98.1 Interview, 8 August 2018 (27:04). ↑ 100.0 100.1 Interview, 17 August 2018 (4:31). ↑ 103.0 103.1 103.2 Interview, 20 October 2018 (9:10). ↑ 104.0 104.1 104.2 104.3 Livestream, 27 September 2018 (34:49). ↑ Livestream, 30 June 2017 (29:13). ↑ 106.0 106.1 106.2 106.3 106.4 106.5 106.6 106.7 106.8 Livestream, 16 October 2017 (34:26). ↑ 107.0 107.1 107.2 107.3 107.4 107.5 Livestream, 16 October 2017 (45:37). ↑ 108.0 108.1 108.2 108.3 108.4 108.5 Livestream, 16 October 2017 (25:08). ↑ 109.0 109.1 Livestream, 17 May 2017 (1:06:19). ↑ Livestream, 19 May 2017 (39:55). ↑ Livestream, 1 June 2017 (22:58). ↑ 112.0 112.1 112.2 Livestream, 8 April 2018 (PM) (46:11). ↑ Livestream, 26 May 2017 (19:03). ↑ 114.0 114.1 114.2 Livestream, 16 October 2017 (35:35). ↑ 115.00 115.01 115.02 115.03 115.04 115.05 115.06 115.07 115.08 115.09 115.10 115.11 Livestream, 16 October 2017 (32:49). ↑ 116.0 116.1 116.2 116.3 116.4 116.5 Livestream, 16 October 2017 (33:04). ↑ 117.0 117.1 117.2 117.3 117.4 117.5 Livestream, 16 October 2017 (38:20). ↑ 118.0 118.1 118.2 Livestream, 16 October 2017 (37:43). ↑ 119.0 119.1 119.2 119.3 119.4 119.5 Livestream, 16 October 2017 (38:04). ↑ Livestream, 15 December 2017 (1:00:36). ↑ Livestream, 8 April 2018 (PM) (40:23). ↑ 122.0 122.1 122.2 Livestream, 16 October 2017 (39:52). ↑ 123.0 123.1 123.2 Livestream, 16 October 2017 (42:20). ↑ 124.0 124.1 124.2 124.3 124.4 124.5 Livestream, 16 October 2017 (43:44). ↑ 125.0 125.1 125.2 Livestream, 16 October 2017 (43:53). ↑ 128.0 128.1 128.2 Livestream, 16 October 2017 (41:26). ↑ 129.0 129.1 129.2 Livestream, 16 October 2017 (45:09). ↑ 130.0 130.1 130.2 130.3 130.4 130.5 Livestream, 16 October 2017 (47:55). ↑ 131.0 131.1 131.2 131.3 131.4 131.5 Livestream, 16 October 2017 (48:04). ↑ 133.0 133.1 Livestream, 3 May 2017 (49:39). ↑ 134.0 134.1 134.2 134.3 Livestream, 19 May 2017 (10:06). ↑ Livestream, 26 May 2017 (43:20). ↑ 136.0 136.1 136.2 136.3 136.4 136.5 136.6 Livestream, 8 April 2018 (AM) (0:58). ↑ 137.0 137.1 Livestream, 8 April 2018 (PM) (11:27). ↑ 138.0 138.1 Livestream, 8 April 2018 (PM) (24:11). ↑ Livestream, 26 May 2017 (32:59). ↑ 140.0 140.1 140.2 Livestream, 16 October 2017 (27:38). ↑ 141.0 141.1 141.2 141.3 141.4 141.5 Livestream, 16 October 2017 (29:20). ↑ 142.0 142.1 142.2 142.3 142.4 142.5 Livestream, 16 October 2017 (29:41). ↑ Livestream, 8 April 2018 (PM) (26:19). ↑ 144.0 144.1 144.2 144.3 Podcast, 11 May 2018 (49:20). ↑ 145.0 145.1 Livestream, 8 April 2018 (AM) (28:01). ↑ 146.0 146.1 Interview, 17 August 2018 (14:59). ↑ 149.0 149.1 149.2 149.3 Interview, 17 August 2018 (17:57). ↑ Video, 9 May 2017 (0:57). ↑ Livestream, 30 June 2017 (30:34). ↑ 152.0 152.1 152.2 Livestream, 12 May 2017 (33:10). ↑ Livestream, 12 May 2017 (18:00). ↑ Livestream, 15 May 2017 (15:10). ↑ Livestream, 18 January 2018 (34:56). ↑ Livestream, 24 May 2017 (57:41). ↑ Livestream, 17 November 2017 (27:35). ↑ 162.0 162.1 Video, 5 April 2018 (40:08).